An unexpected, completely blind tasting courtesy of SJ – and the first I’d done for about a year. I think I got lucky, but I guessed “a Cabernet-dominated blend; Old World; probably Bordeaux, but above base-level quality – Bourgeois? And showing some maturity – 2007”. 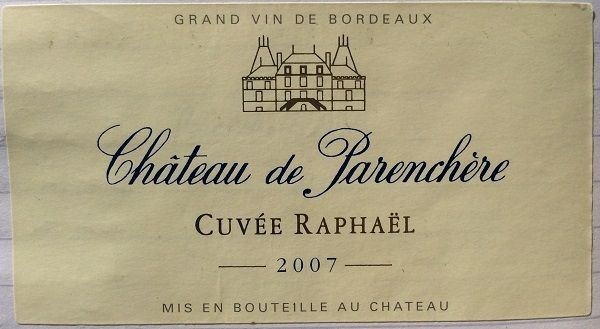 Turned out to be a majority (60 or 70%) Cabernet Sauvignon Bordeaux Superieur. Smug? Oh yes… Mid-deep garnet. Quite intense nose that immediately said Cab / Bordeaux. Why? It’s something vaguely baked-bean like: a mix of spice, savoury, plum / blackcurrant, vanilla hints, dried herb. Or something. Quite pronounced tannin with just a hint of greenness at the finish suggested 2007. But quite long and well-enough handled tannins & flavour depth suggested above-average quality standard. Pretty good overall.